Sketches, Portraits, Animal Portraits, Caricatures, Jewelry, House Sketches, - More Gifts! The Portrait Wiz - will create your portrait from a photo. For a great wedding gift: a portrait of the bride or the bride and groom, approx. 11" x 17". He also does animal portraits , famous people portraits , wedding caricatures and other great caricatures of people's hobbies. Portraits of your children, parents, or several generations together in one composite portrait . See his work on his on-line catalog at www.portraitwiz.com . Leo's Artistic Iron Pot Racks - Custom Pot Rack, Stemware Rack and Gate builder. Pen & Ink Sketches of Your House by Pat Smith from your photograph: a special housewarming gift as well as a wonderful way to remember the old homestead. Friends, family, business associates, realtors and others can give a gift with special meaning. .KettleCornByGiggles - hand-popped kettle corn in the Connecticut and nearby Massachussetts, New York area: street fairs, picnics, conventions, parties, fund-raising - more! Wooden Toys and More, home of handcrafted wooden rocking horses, toy trucks and trains, KidKraft children's furniture, pedal cars, and fanciful playhouses & puppet theaters. Eclectic handmade art and gifts in many styles by one artist . Personalized Address labels, Bookmarks, Notecards and Stationery - The Country Collection. This is the place if you love Country! Crown Jewels . . . Strange Properties of Stones This site sells unique, handcrafted jewelry and hair pieces, but also is a fun site to visit. They offer everything from free gemstone postcards, a chat board, classifieds, search engines for astrological birthstones, and healing stone searches that result in specific gravity, hardness, the corresponding chakras and more! PK Steel Designs, based in Kansas City, designs and manufactures modern steel furniture that is built to last. We provide custom design services as well. Dimensions, finish, and color can alter any piece. You can also design a piece yourself. Your ideas can easily be transformed into furniture perfect for your living space. Our welder, with 40 years of trade experience, is dedicated to quality craftsmanship. Soulpaks - Custom 5 Senses Giftpaks for all Occasions! SoulPaks.com offers soulful gift packages called SoulPaks featuring items for the 5 senses. Send SoulPaks for corporate and personal gift occasions. Use our pioneering CHANGE buttons to customize! Stop by to WIN SoulPaks too! Kerry's Scroll Saw Portraits in Wood Transform your cherished portraits into a work of art like none other you have ever seen. Whether you are looking for an anniversary gift, a birthday gift, a Christmas gift, a wedding gift, or a Mother's day gift, one thing is certain...this will be among one of the most unique gifts you will ever give. The Lighthouse Man: The "LEADING" Manufacture of Custom Crafted Lawn Lighthouses, & Lighthouse Accessories. Artist Teresa Bernard Animal Art And Wildlife Oil Paintings - Original wildlife oil paintings for sale - including portraits, seascapes, still life, landscapes, religious art and commission art. Free online art lessons. Also offering professional Web design and SEO for the visual arts. About Isabel Gallery - Reproduction Oil Paintings. Isabel Gallery offers prestigious fine art reproduction oil paintings of Masterpieces, entirely hand painted: Van Gogh, Renoir, Cezanne, Bouguereau, Degas, Manet, Botticelli, Gauguin, more. All About Dolls Everything about doll wigs, doll stands, doll eyes and doll accessories for porcelain, vinyl or softbody dolls. Clothing Creations by Irmgard - Clothing for 18 inch tall dolls , with matching clothing for the little girls who own them. popular decorative finishes on the market today. Description: Artistic designs, custom handcrafted jewelry, birthday gifts, anniversary gifts, unique styles, trendy fashions and affordable. Gift Baskets, Papier Mache Faux Fruit Arangements and PopArt Sculpture: A vast number of choices and Free Paper Mache Lessons as Well. Leather Goods by Natural Reflections : Leather handbags, belts, backpacks and wallets . Signs of Wood, Company: Personalized 3-dimensional wood signs for gifts and business. Over 180 art center to choose from and your custom wording make for a truly personalized and unique gift. http://www.imaginationmarket.com/ Imagination Market - Unique Handcrafted Gifts from Canada Browse our market for gifts sure to please. Free parcel post in Canada and the Continental U.S.
http://www.patagoniagifts.com Artisans from Patagonia: handcrafted art gallery including hand made silver jewelry, unique ceramic pottery, fine wood art and natural leaf jewelry gifts. The Ultimate Hair Accessories! Unique, Handcrafted and Extremely Comfortable! Works in all styles and lengths of hair. See easy hair styles with step-by-step instructions. FREE SHIPPING in the US for all orders $50 or more. Dog Show Supplies Finally, one place to buy everything you need for your best friend. http://www.caleyart.co.nz Caley Art: fine art paintings, drawings of New Zealand, Maori artifacts,-more. http://www.drakebriscoe.com Here you will find an exhibition of works from the studio of the well known English restorer of antique lacquer: Mark Briscoe, an artist working in a number of diverse styles, originally from the U.K. He is currently based in North Eastern Spain. , Mark Briscoe has been recognized as one of today's leading exponents of Indian classical painting, as well as his chinoiserie decoration on furniture. 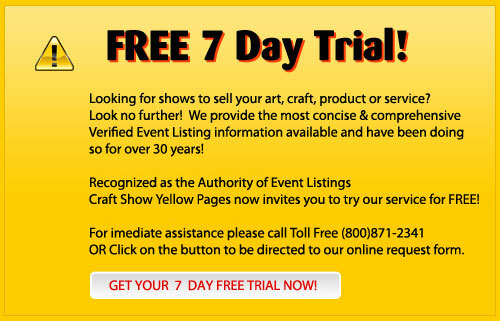 Art & Craft Show Yellow Pages - art and craft shows, fairs and festival listings in the New England and Mid-Atlantic States for craftsmen, artists, food vendors, resellers and performers. Published quarterly. Call 888-424-1326 or subscribe online. 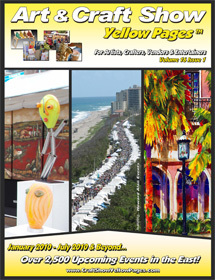 Art and Craft Show Yellow Pages - Art and craft shows, fairs and festivals in the northeast and mid-atlantic states. Detailed information for craftsmen, artists, food vendors, performers and resellers.